Compiling The ExtPlane Plugin (on Linux and Windows) | Life, The Universe and ... Everything! There appears to be quite a bit of updates going on with the ExtPlane plugin source code in the last few months, and it turned out some of these are needed to fix some of the bugs I am facing when using it. Unfortunately, to get the latest and greatest version, you have to compile it yourself. Here are my notes on how to go about compiling the plugin on Linux and Windows. Note: If you are using my Pi-XPlane-FMC-CDU, you can just use the pre-compiled binaries linked to in my post here. This post is more for those who would like to know more about the compilation process, and/or want to compile it themselves. And that's it ... the linux-version of the plugin can be found in extplane-plugin/extplane/64/win.xpl. The last time I actually compiled anything for windows, the compiler had the name "Borland" in it 😃. But since my proper X-Plane Flight Sim setup runs on a dedicated WIndows PC, I need a WIndows ExtPlane plugin also. After a few false starts (Visual Studio Community Edition ... 😓), here are my notes on setting up a Linux-ish Windows build environment as well as compiling the ExtPlane plugin. These notes are for a Fresh Windows 7 (fully updated) with just a Chrome browser installed. Install MSYS2. MSYS2 is an environment for building and packaging lots of open-source software. It provides a GNU toolchain that lets you build native windows apps, and also provides a UNIX-ish environment to build them in. Click on the "msys2-x86_64-20161025.exe" button at the top (x86_64 indicates a 64-bit version) and run the downloaded installer. Press Next, and install into "C:\msys64". Press Next. Press Finish when done. Using Windows Explorer, open C:\MSYS64 and right-drag the "msys2.exe" and "mingw64.exe" to your desktop, and create shortcuts. Both of these can be used to open a shell prompt. They differ in the paths and environment they have set up, in particular "mingw64" has /mingw64/bin on its path, which is where the 64-bit compiler resides. Use "mingw64" when building stuff. I was prompted to remove "catgets" and "libcatgets", and just agreed to it. I was also prompted to close the window at the end of the update. Configure OpenSSH Service. This lets you ssh into a windows box into a msys2/mingw64 terminal. Pretend your Windows box is Linux ! Right-click on the msys2 shell icon, and "Run as Administrator"
Start -> Run -> "Windows Firewall with Advanced Security"
Select "Inbound Rules", the right-click "Inbound Rules" and choose "New Rule". 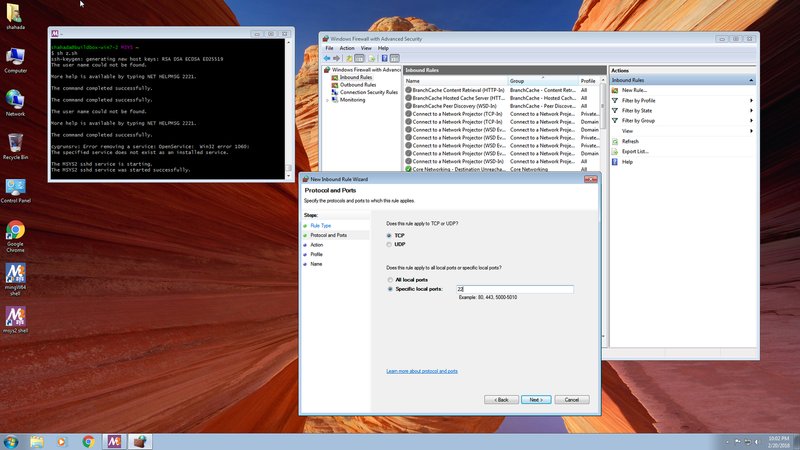 find the line set PermitUserEnvironment, remove the "#" and change "no" to "yes"
You can now ssh into your windows machine ! 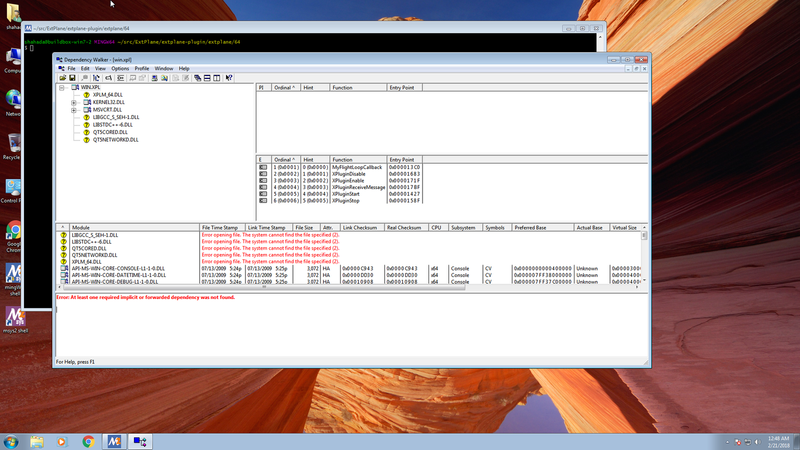 Now we are ready to build the Windows version of the ExtPlane plugin. The instructions below download the XPlaneSDK and ExtPlane git repository (what I actually did was to share the "src" folder from my Ubuntu machine (using Samba) and mounted it as "s:" on the Windows machine). Tthe fun doesn't end there. Those dependent DLLs you copied in, also have their own dependent DLLs, so you will need to go through each one and find their dependencies, and then go through each of those, and so on. One thing that may help is to add the extplane-plugin/extplane/64/ folder into the Dependency Walker's path, so only those that are really missing will turn up in yellow. It can be frustrating, but almost everything you need will be somewhere in the /mingw64/bin folder. XPLM_64.DLL is the stub used by the X-Plane SDK to compile this. When actually run, it will be provided by the Flight Sim itself, so we don't need to worry about it. Copy them to the same folder where the plugin is located (~/src/ExtPlane/extplane-plugin/extplane/64/). I'm not sure if all of them are strictly needed or not. Copy the src/ExtPlane/extplane-plugin/extplane into your X-Plane Flight simulator's Resources/Plugins directory. I like to rename it with the commit details and the date so it is easy to tell subsequent versions apart. Since the ubuntu and windows machine are scriptable, it should be possible to write a script that will automatically pull the latest copy, build all the versions for each platform and zip it up properly. I'm not sure if the linux version has any dependencies. If someone has a clean linux machine with just X-Plane it would be good to test this out. Let me know the results. This is my first attempting this, so I would appreciate any feedback you may have in the comments below.